Want a Kindle Fire? You're out of luck. What timing! Exactly one week before Amazon is expected to unveil a new Kindle line, the company announced on Thursday that its Kindle Fire tablet is sold out. Amazon (AMZN) sent out press invitations last week for a Sept. 6 event in California. While Amazon didn't reveal the subject of the event, it's widely expected that the company will unveil new versions of the Fire tablet and Kindle e-readers. The sell-out isn't all that surprising: Retailers often let stock sell out or offer steep discounts on merchandise that is about to be replaced with newer versions. Thursday's press release about the Kindle Fire sell-out didn't reveal how many have been sold, as Amazon famously doesn't release Kindle unit sales. The company did say the Fire comprised 22% of U.S. tablet sales in its nine months on the market, though the source of Amazon's data is unclear. IHS iSuppli's analysis found that the Kindle Fire never held more than a 14% share of the tablet market, and sales have slipped in recent months. The 7-inch Kindle Fire began shipping in November for $199, clearly aimed at undercutting Apple's (AAPL) wildly popular $499 iPad. The Fire is geared towards media consumption: reading books and magazines, watching video and streaming music. 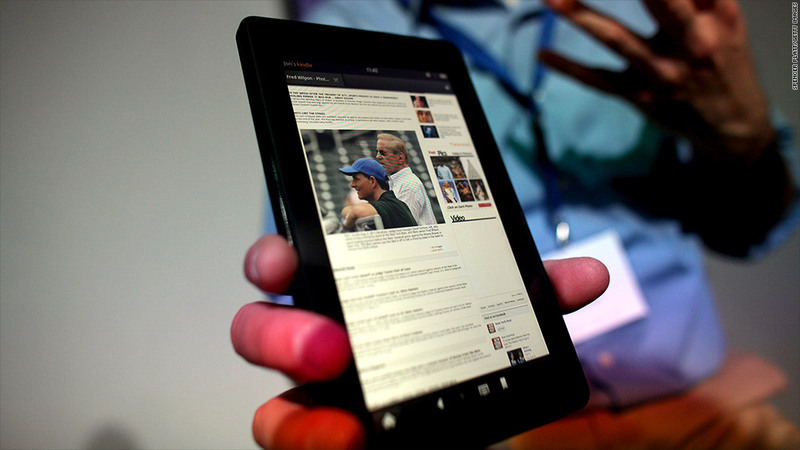 Among the rumors about next week's event: Amazon may announce a 10-inch Kindle Fire. That would be slightly bigger than the 9.7-inch screen on the iPad. At the same time, Apple is rumored to be releasing a smaller version of the iPad at its own event sometime in September or October. The so-called "iPad Mini" will purportedly be a 7-inch device -- just like the current Kindle Fire. Apple controlled more than two-thirds of the tablet market in the second quarter, according to iSuppli's most recent data. Samsung has captured about 9% of the market, and Amazon came in at the No. 3 spot with 4%. Rounding out the top 5 were Asus with 3% and Barnes & Noble (BKS) at 2%. It's a tough market to play in, littered with other tablets that sorely disappointed or died outright. In the most extreme example, Hewlett-Packard (HPQ) killed off its TouchPad last year after just 49 days on the market. BlackBerry maker Research in Motion (RIMM) released its PlayBook tablet in April 2011 and immediately drew criticism for its unfinished feel. Motorola's Xoom debuted at $799, and sales were sluggish.